Sign up to watch this 7-minute video now. Hypocrisy is addressed so rarely in couples therapy training that you might not have given it much thought. Yet hypocrisies can undermine intimacy in your couples – and undermine your work at the same time. 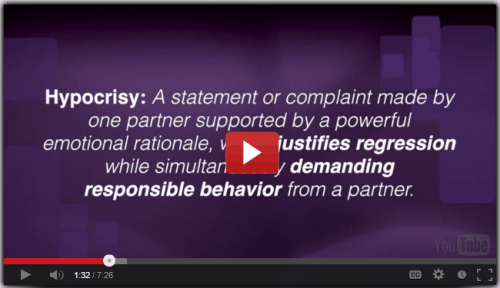 Sign up to watch this 7-minute video on the four types of hypocrisy in couples therapy. You’ll also receive a transcript demonstrating the confrontation of bitter, nasty fighting. Just enter your name and email address in the box to your right to watch the video and receive the email series. Sign up now. I invite you to join the discussion section of the blogs as you absorb some of this new way of looking at relationship challenges, and I look forward to reading your comments. When basic trust is missing, partners fear they are not loveable. They become afraid when their lovers are absent or withdrawn and often create binds that demand their lovers prove them unconditionally loveable. 2. Problems with self-other differentiation. These partners desire highly merged relationships and angrily or more subtly create binds to coerce their partners to comply. 3. Limited ability for self-soothing. These partners often demand “mind reading,” stay agitated and make unflattering decisions about the other. All partners who create hypocritical binds have difficulty in this area. The bind in fact includes a rationalization for them not to take action. These four developmental issues also contribute to partners having difficulty knowing what they desire, activating positive energy to pursue desires, and raging at partners who seem to “get more of their desires realized.” What’s even worse is that these developmental issues fuel the creation of binds that inhibit the long-term growth and development of the relationship. The tragedy, of course, is that both partners lose out on the promise that brought them together. To get us into this topic more deeply, I’ve prepared a short video discussing 4 common types of hypocrisy, with examples of each. I hope you’ll sign up for it in the box above. 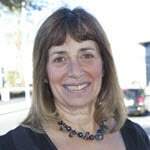 Who Is Dr. Ellyn Bader? Ellyn Bader, Ph.D., and her husband, Dr. Peter Pearson, are founders and directors of The Couples Institute and creators of The Developmental Model of Couples Therapy. Dr. Bader is widely recognized as an expert in couples therapy training. She has trained therapists throughout the United States as well as in Europe, Russia, Asia, South America, and Australia. Ellyn has authored two books. The first one, In Quest of the Mythical Mate, was awarded the Clark Vincent Award by the California Association of Marriage & Family Therapists for its outstanding contribution to the field of marital therapy and is now in its 18th printing. She has been featured on over 50 radio and television programs including The Today Show and CBS Early Morning News, and she has been quoted in many publications including The New York Times, O, The Oprah Magazine and Cosmopolitan.